Cos-B carried a single large experiment, the design and provision of which have been the responsibility of a group of research laboratories known as the Caravane Collaboration. The experiment has been described in detail by Bignami et al. (Ref.1). The essential parameters for the measurement of gamma-rays incident parallel to the experiment axis are shown as functions of energy in figure 9. The values given are those appropriate to the stringent conditions for event selection which are applied to the flight data in order to improve the signal/noise ratio. The effective sensitive area reaches a maximum value of about 50 cm2 at around 400 MeV. 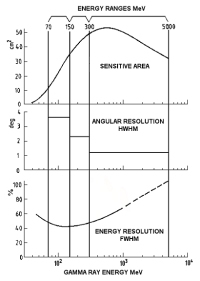 The angular resolution is given as the FWHM of the spatial angular resolution or point-spread function, which best describes the experiment's capability to resolve two neighbouring point sources. It decreases asymptotically to about 2 deg at high energies. The energy resolution has its best value (~40% FWHM) at about 150 MeV and is better than 100% up to at least 3 GeV. All these parameters degrade with increasing angle of incidence. The sensitive area falls to zero at an angle of about 30°. Most of the results published have been derived from measurements within 20° of the axis-pointing direction. Alongside the gamma-ray detector is mounted a proportional counter, sensitive to 2-12 keV X-rays, to provide synchronisation for possible short-period pulsations of gamma-ray emission from X-ray pulsating sources. The pulsar synchroniser has also been used for monitoring the intensity of radiation from X-ray sources. 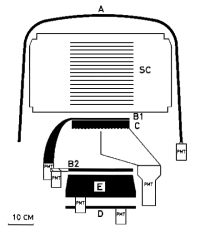 The Spark Chamber was a 30 kg vessel. Nine aluminium oxide ceramic rings one over the other formed the walls of the cylinder. The Spark Chamber was to convey a pulse of 10 million watts in 0.2 millionths of a second. An incoming gamma-ray traverses the protective Veto-Dome (which rejects charged particles) and converts it into an electron-positron pair in thin tungsten-plates dispersed in the Spark Chamber. The resulting electron and positron are detected by the directional (up-down discriminating) Triggering Telescope which fires the Spark Chamber. The tracks in the Spark Chamber left by the electron-positron detected are transmitted to ground. These determine the arrival direction of the incoming gamma-ray. The energy of the gamma-ray is estimated by the signal generated in the Energy Calorimeter. Cos-B was sensitive in the range 30 MeV to 10 GeV. The Gamma-Ray Telescope performed well throughout the mission; the only complication being the occasional erratic performance of the spark-chamber and the inevitable reduction in performance as the spark chamber gas aged. This aging was, however, minimized by means of a gas-replenishment system that permitted emptying and refilling of the spark chamber. As the rate of gas deterioration decreased with time, it became possible to increase the interval between flushing from its initial value of once every 6 weeks to about once every 36 weeks before the final flushing in November 1981. The spark chamber was still performing creditably at the end of the mission.